[up] OFFICE and SERVICES OFFERED. hypnotherapists are PROFESSIONALS expert in hypnosis who REFRAIN from doing diagnoses or treatments. hypnosis is a NATURAL functioning of the nervous system that activates valuable SELF-HELP abilities. in hypnosis all the BENEFITS are self-generated by clients; the hypnologist can only stimulate such activity. the client comes in office WHEN (S)HE WANTS, and learns auto-hypnosis freely, taking decisions each time. hypnotherapy lacks a firm scientific basis, but there is an EMPIRICAL EVIDENCE of safety and usefulness. hypnotherapy can be used also in a COMPLEMENTARY sense, as a self-help and to support treatments/cures. hypnotism is NOT A CURE NOR A SUBSTITUTE of it, and therefore symptoms require a medical monitoring. in hypnosis THE PERSONALITY REMAINS THE SAME, with full abilities of will-power and understanding. I consider USELESS to analyze the past, to talk about present problems, or to suggest future changes. I RIGOROUSLY refrain from any act that can constitute an unauthorized practice of a regulated profession. I keep a strict confidentiality (professional secret). I safeguard the human dignity and I protect minors. I inform as honestly and transparently as possible. I always leave to the clients the full power of choice. I rigorously refrain from unlawful or deceptive actions. I work only within my limits of competence and experience. 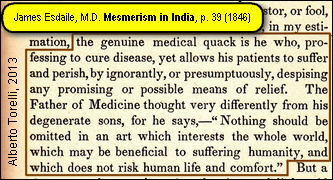 I leave to physicians the diagnosis and cure of symptoms. I reject any violence or abuse, and any client is my peer. I keep myself neutral, and I never judge nor discriminate. I do refuse to work if a personal relationship develops. [up]. 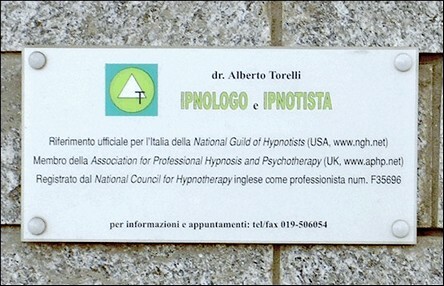 I am a HYPNOTHERAPY practitioner ("ipnologo" in Italian), and I TRAIN whoever wants to learn how to use better her/his personal hypnotic ABILITIES, that is those important processes of adaptation, maintenance, homeostasis, and regeneration which are present in all living beings, and which we generally refer to as animal or human hypnosis. These BIOLOGICAL FUNCTIONINGS of self-help are by their nature spontaneous, deep, almost automatic, uncontrollable, and they DEPEND ENTIRELY ON THE ORGANISM THAT ORIGINATES THEM. That's why hypnosis is natural, innocuous, and beneficial. About benefits, the World Health Organization (WHO) defines the HEALTH as a state of complete physical, mental, and social wellbeing, and not simply the absence of illnesses or infirmities. In fact, there are the therapies, that are aimed to detect and remove the causes of symptoms and pathologies, and there are the HOLISTIC APPROACHES, that are focused on OTHER aspects of the extended concept of health (energy, strength, concentration, self-control, general wellbeing, harmony, serenity, satisfaction of needs, strengthening, recovery, etc. ), that is they are INTERESTED IN THE HEALTHY PART, and not in the sick part. These holistic disciplines are important and numerous; some of them use instruments or devices (acupuncture, biofeedback), body manipulation (chiropractic, osteopathy, reflexology, shiatsu), or various products (herbalism, homeopathy, traditional Chinese medicine, naturopathy, aromatherapy, Bach flowers), while other disciplines are more natural, don't even require the knowledge of the person nor the contact with her/him, are entirely based on the self-determination of the client, and are ORIENTED AND AIMED TO THE GLOBAL IMPROVEMENT OF THE QUALITY OF LIFE (autogenic training, HYPNOTHERAPY, meditation, yoga, anti-stress counseling, spiritual healing, tai chi, qigong). The listing is not exhaustive, and it serves only to give an introductory idea to naive readers. [up]. I have studied in UK, where I have got the "HYPNOTHERAPY PRACTITIONER DIPLOMA" (HPD, n. F035696), that is the gold standard for a credible, independent accreditation at a national level, since none of the assessors has any connection to the training providers. Being the practice of hypnotherapy free, my qualifications and achievements are mentioned for merely informational purposes. HYPNOTHERAPIST: English diploma as hypnotherapy practitioner (GIF, 697 KB; GIF, 189 KB; GIF, 310 KB). INSTRUCTOR: see the training section. SUPERVISOR: see the supervision section. AWARDS: special award for my services to the profession (GIF, 128 KB); award for "the most outstanding contribution to the hypnotherapy profession, 2006" (GIF, 207 KB); honorary membership of the Australian Hypnotherapists' Association (GIF, 127 KB). 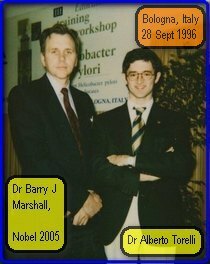 UNIVERSITY: MA (master of arts) degree, after 5 years of university in Italy, as "dottore in scienze biologiche" (doctor in biological sciences) (PNG, 378 KB); academical award of "dignity of press" for my university thesis, then published at the Oxford University (PDF, 985 KB); cooperation with Barry Marshall, Nobel prize 2005 for Helicobacter pylory studies (JPG, 24 KB; PDF, 2.2 MB). 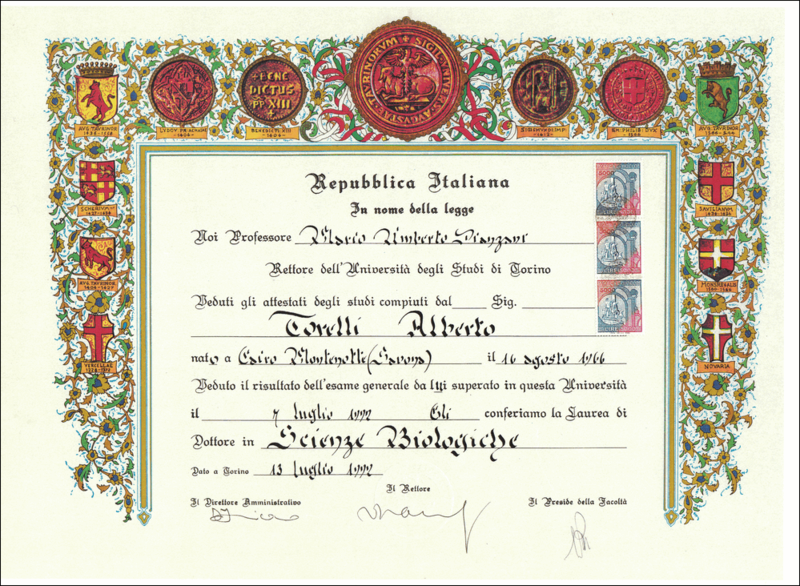 OTHERS: further certificates can be found in the archive section. [up]. For me hypnosis is one of the most fascinating innate abilities of the organism to MAINTAIN, ADAPT, and STRENGTHEN. These INDIVIDUAL ABILITIES of SELF-CONTROL are the core of the hypnotic work, and therefore it is important to know that PROFESSIONAL HYPNOTISM is an instructive-experiential service (for "active" clients), and not a diagnostic-curative service (for "passive" clients). In addition, every human being has the inviolable right to live as (s)he wants, and NOBODY, EXCEPT THE LAW, CAN LEGITIMATELY FORCE ANOTHER PERSON to do something or to refrain. Consequently, I refuse to consider a person "defective", I don't like at all to give advices or suggestions, I REJECT EVERY TYPE OF ABUSE, COERCION, MANIPULATION, VIOLENCE, or INTRUSION in other people' life, and personally I dislike hypnotic regression and hypno-analysis, and I dislike even more the common but wrong conception of hypnotherapy as a "treatment" or correction, because for me every person is fine just as (s)he is, and therefore THE CLIENTS CAN LEARN WHATEVER HYPNOSIS THEY WANT WITHOUT TELLING ABSOLUTELY ANYTHING ABOUT THEMSELVES. The approach that I offer is therefore VERY DIFFERENT, and WELL DISJOINED from the "psy" world of the so-called mental disorders; in fact hypnosis DOESN'T CHANGE PEOPLE IN ANY WAY and it never even tries to do that; on the contrary, hypnosis helps people to do their best IN THE STATE IN WHICH THEY ARE, making the cooperation fully safe, innocuous, and pleasant. In short, being a biologist, I PROMOTE the ECOLOGY and the ECONOMY, because for any living organism they are two essential elements of the SELF-DEFENCE. Moreover, in the human beings these winning forces can also be utilized specifically for enjoying the present life at the best possible level and by using what is already available, that is what I call "the GOOD PART". Below I summarize MY POINT OF VIEW and MY BELIEFS. 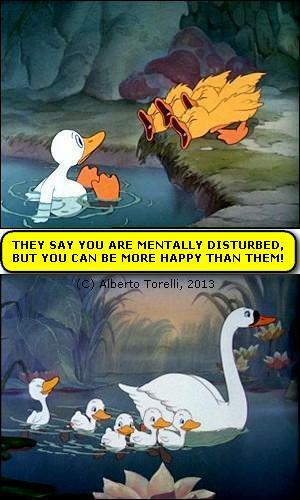 you don't need a therapist in order to enjoy life (JPG, 33 KB) (PNG, 2 KB). nobody can really understand people (GIF, 2 KB) (GIF, 2 KB). to analyze the past is a waste of time (PNG, 2 KB) (PNG, 2 KB). the mind theories are not realistic (GIF, 4 KB) (GIF, 4 KB). the "therapist" has no therapeutic power (PNG, 27 KB) (GIF, 3 KB). [up]. Duration and costs are determined by the client. The auto-hypnotic training is not a cure, hence the client is free to do whatever (s)he wants and as long as (s)he wants, because there are no routes, cycles, paths, or series of appointments. All clients can begin, terminate, restart, or experiment as they wish, without ties or recommendations of any sort, and they decide each time in total autonomy and on their own initiative. Instead of individual sessions, it is also possible to join group lessons, because in any case the training is based on practical exercises. If a client shows disrespect for the appointment or behaves in a way that causes a damage to the service or to other clients, then the hypnologist can request a compensation or can refuse to such client further accesses to the office. Lastly, please notice that an hour of work comprises also the formalities at the end of the session (payment, possible new appointment, farewell), and therefore it really corresponds to about 50 minutes of actual work. Of course it is possible to book also more than an hour, especially when the client comes from very distant places. THE PRICES LISTED BELOW ARE FOR EACH PERSON FOR AN HOUR. first meeting (1 hour or more): 80 pounds. second meeting (if any): 70 pounds. further meeting (if any): 60 pounds. phone or webchat session: 50 pounds. group lesson (2 persons): 40 pounds. group lesson (3 persons): 30 pounds. group lesson (4 persons): 20 pounds. special or experimental cases: 10 pounds. [up]. About hypno-therapy, please keep in mind that this name comes from two unfortunate historical errors, because "hypno" means sleep, but today we know that the trance is actually very similar to the waking state and very different from sleep; and "therapy" is deceiving, because the nature of hypnosis is essentially autogenic, that is it depends on the body and on the mind of the person, and not on an external technology (therapy). 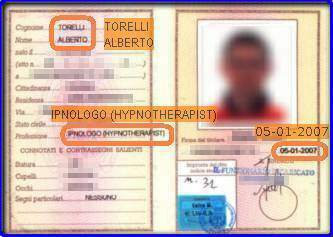 This is why I like a lot more the word HYPNOLOGIST ("ipnologo" in Italian), which appears even on my identity card and on the plate of my office since 2003.
the plate of my first hypnology office (JPG, 50 KB) (PNG, 37 KB). 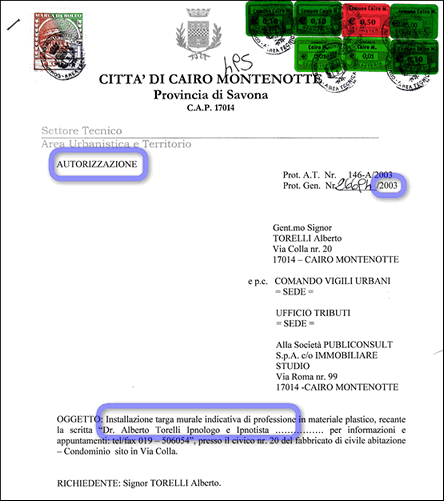 'ipnologo' is also on my identity card (JPG, 16 KB) (JPG, 36 KB). [up]. The user needs to keep in mind that there are many contradictory definitions of hypnosis, and therefore a good hypnotherapist should explain well her/his hypnotic approach, and should clarify that EVERY STATEMENT ON HYPNOTISM IS ACTUALLY JUST THE PERSONAL OPINION OF SOME EXPERT, or it is at best the individual position of one of the many schools of thought in the field. In my case please read (or read again) the point 1, about the nature of my services (here). Every true professional has the DUTY of protecting the consumers from a misleading advertising or practice, and has the RIGHT of being independent in thought and outlook, and therefore must be willing to speak honestly and without fear or favour. The practitioners must not allow themselves to be put under the control of dominance of any person or organization which could impair their independence or could try to intimidate or slander or behave illicitly. For example, those people that describe hypnosis in terms of suggestion, or technique, or cure, or psychotherapy, in my opinion are denying the reality, because they don't realize that their theories are clamorously contradicted by the evidence, hence they are unreal and anti-scientific; in fact, they are completely unable to explain the form of hypnosis that is by far the most common and widespread, that is AUTO-HYPNOSIS, which doesn't require any operator. 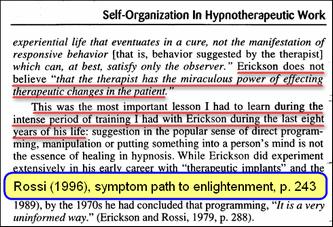 It is on the contrary realistic and coherent with the evidence to say that hypnosis is a physiological functioning of self-maintenance, and therefore hypnology is a professional service which REQUIRES HOLISTIC COMPETENCIES and training that physicians and psychotherapists, as such, don't have (on the other hand, hypnotherapists are not competent in diagnoses and cures). Because of the fact that hypnotism is not regulated (because it is innocuous), the title of HYPNOTHERAPIST will be always exhibited in public also by people that have no specific and credible training in professional hypnotherapy. A typical example, in my opinion, is the sad reality of those people who, being unsuccessful in their profession and losers in their life, try to become self-styled hypnotherapists and hypnosis charlatans, and practically exploit their license (or other alleged qualifications) for deceiving the consumers and discrediting the genuine hypnotherapists. But this is obviously not a matter of titles and diplomas, but an issue of ethics and respect toward the people. I'm telling this not in order to make some comparison or advertising, but, on the contrary, with the aim of helping to understand two things: that HYPNOTHERAPY SHOULD BE NEVER MISTAKEN FOR A CURE OR A CLINICAL COUNSELING, and that, despite it's still very young and in a continual development, HYPNOTHERAPY HAS GROWN INTO A TRUE PROFESSION, now recognized by everybody, but unfortunately not yet far enough from the quackery of the tech-buffoons of the suggestion. And finally, dear reader, keep in mind that my website cannot offer the truth, but it simply describes and represents my ideas and MY OPINION, that is a completely subjective and personal point of view, which should be intended as a stimulus to think, to gather information, and to take more conscious decisions. there is no curative nor medical nor psychological hypnosis (GIF, 3 KB) (PNG, 3 KB). 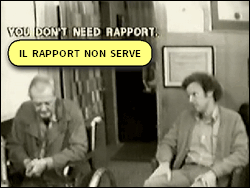 hypnotherapy is not a psychotherapy but a natural self-help (PNG, 10 KB) (GIF, 50 KB). therapeutic "suggestions" are useless rubbish (PNG, 3 KB) (PNG, 2 KB). hypnosis generates autonomy, and the relationship is short (PNG, 29 KB) (GIF, 3 KB). hypnotic "techniques" have no therapeutic power at all (GIF, 5 KB) (PNG, 6 KB). those who use stage hypnotism defame genuine hypnotherapists (JPG, 120 KB) (GIF, 84 KB). hypnotism is innocuous even in case of malpractice (PNG, 2 KB) (GIF, 19 KB). any GP should consider complementary hypnotherapy (GIF, 3 KB) (PNG, 38 KB).